It was a hot and dusty day. Jesus and his disciples were on the road again and, as usual, Jesus walked with a purpose; he knew where he was going. He was headed to Jerusalem, but this time he had decided to travel right through the heart of Samaria. The disciples I suspect were probably unhappy and uncomfortable with this trip. There are, after all, other ways to get to Jerusalem without going through Samaria, but Jesus had specifically chosen this route, and here they were near the town of Sychar, right near the Samaritan holy place: Mount Gerizim. It was not easy traveling through Samaria, not only was the terrain rough and mountainous but there was such bitter hatred and animosity between Judeans, like Jesus and the disciples, and Samaritans. The conflict went back several hundred years. Samaritans were Hebrews as well, descendants from 10 of the tribes of Israel. Judeans were descendants from the other two of those tribes. Their principal conflict centered around the question of Where is God to be found? For the Judeans the answer was clearly in the Temple in Jerusalem. For the Samaritans the answer was on the holy mountain: Mt. Gerizim. And because of this disagreement they were bitterly divided, considered each other heretics and refused to have anything to do with each other. But here was Jesus and the disciples – deep in Samaria and it was midday – noon – the hottest time of the day. Jesus stops to rest besides “Jacob’s Well” and his traveling companions go into town to acquire a few provisions. Then something strange occurs – a woman approaches to draw water; a Samaritan woman. Why is this strange? Because it is noon. Usually the women came to the well to draw water early in the morning and at sundown, when it was a little cooler. So why was this woman coming at this uncomfortable time to do the back-breaking work of drawing water, filling her jug and then carrying it back to town? We don’t know for certain, but it does suggest that perhaps she was an outcast from her own society. So if you can picture the scene – Jesus is sitting there, perhaps under a Palm tree. 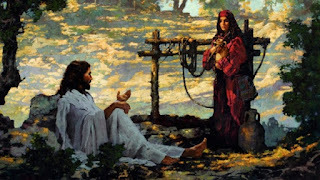 He watches this Samaritan woman approach the well. And Jesus can tell right away that not only this woman is a Samaritan (who Judeans like Jesus avoided and had nothing to do with) but she was also an outcast from her own community. I imagine Jesus watching her as she approaches and does her work, and I expect for her part the woman probably tried to ignore Jesus – that is until he stunned her by speaking. N tried, but in the end he just cannot understand what Jesus is trying to say / The SW however does come to understanding and embraces Jesus’ teaching. This story is, 1st of all, about insider/outsider – before a word is spoken we, the readers know that the insider – N – will not be able to see and understand. The darkness of the night of his own preconceptions and expectations will blind him to the incredible encounter with the incarnate Word of God in Jesus. And he will leave Jesus still in the dark. By contrast the Woman who begins this encounter as an outsider in every way will see the brightness of God’s love reflected in Jesus and will embrace this gift. She will believe, which we learned last week means that she will enter into a relationship with God through Jesus and she will ultimately return to her community and invite others to come and see! – To enter into a relationship with God in Christ. These two chapters – these two stories confront and challenge us to look at ourselves: are we inside or outside? Can we see? Do we believe, that is, are we in a relationship with God through Jesus? And does this relationship lead us to share this gift of God’s incredible love with others? Ultimately, that is after all what it means to believe – it means to live a life of love! But let’s return to the story. It is at this point that we need to address a very common and popular interpretation that has tended to affect the way this passage is understood. In verses 16 through 18 Jesus asks the woman to go and fetch her husband. She replies that she has no husband and Jesus affirms that, adding that he knows she has had five husbands and that she is living with a man who is not her husband. Many preachers and commentators down through the years have interpreted this to reflect badly on the moral character of this woman – and thus distracted by this non-issue end up missing the point of the story. Please note – at no time does Jesus condemn this woman and neither does he ever offer her forgiveness. Why? Because she has nothing to be forgiven for. The fact that she has had 5 husbands would not have been her choice or her fault. Women in 1st century Palestine had no choice over those kinds of things. She was a victim. She was either widowed or divorced – which would have all been done TO her - without her input or assent. If anything she deserves our compassion. This story is not a story about morality – it is a story of identity and relationship. In other words – open your heart, God’s dwelling is not in any particular place – God lives with and among God’s people. People just like you. Even though you may be excluded by the society, you are not excluded by God – God is open to all who open their hearts. In John 1:14 we read: and the Word was made flesh and dwelt / tented among us. God is no longer remote. God is available through the Son. And if that was not enough Jesus finishes off this section with an important and central confession: I AM – Jesus says. (The phrase that appears in the NRSV translation – “I am he” is incorrect – there is no “he” in the Greek. It is just “I AM.”) This of course is the name of God, and unlike the Pharisees the woman doesn’t flinch. She accepts and believes – that is she enters into a relationship with Jesus, and it changes her life and her way of being in relationship with others. Ultimately this passage is about identity and belief. Who is Jesus? Jesus is the Messiah – Jesus is the Word made flesh – Jesus is the I AM come into the world. And to whom does Jesus come? To all who have open hearts – to all who believe. You don’t have to be a certain class or ethnicity or believe the right dogmas or be perfect or be male or from a particular culture or race – God so loved the world… – God is open to all who follow and believe in Jesus the Christ. This Samaritan woman represents the outsiders of the world to whom the Son has been sent to love. And her faith and action mark her as one who is a child of the light and who has been given the gift of relationship with God in Christ now. Like her we too are called to open our hearts and allow our belief to be reflected in the way we live our lives. Like her we too are called to be in a relationship with God which calls upon us to witness, to share this gift of God’s love to all whom we encounter and to invite them into relationship – to invite them to Come and See. I can imagine that at the end of the story Jesus watched as the woman rushed back to her village, leaving her water jar behind – leaving the brokenness and hurt and exclusion behind; as she went to tell and invite. In the same way Jesus is gazing at us – Jesus is offering us the gift of Living Water – Jesus is inviting us into this relationship of love! Jesus is inviting us to – Live a Life of Love! John Series - Sermon #2 - "Come and See"